I don’t know whether the producers of The Apprentice make a note when they are picking candidates, or whether there is some strange kind of symbiosis between getting on in business and being a frustrated actor or director, but whenever Sir Alan dusts down the advertising task there are always one or two candidates willing to step up to the mark with an attempt to showcase their movie making talents into thirty seconds, and missing the whole point of the task. This time it was Raef and Michael, who having discovered a shared interest in amateur dramatics launched into scripting their advert before the team had even decided on a brand for their box of tissues – the choice of product for the advertising task this year. Fellow team members Claire and Helene were pretty well left to get on with designing the box, putting together the press advert and the final presentation, while Raef and Michael recruited SiÃ¢n Lloyd for their advert and produced a beautifully shot fifty second drama to try to win the task. The problem? It had to be thirty seconds, so they cut the in-your-face product shot, and cut their start turn down to a blink-and-you-miss-it moment, leaving mainly a sequence with two child actors sharing a tissue, but without the product box in sight. Claire pulled together a slick presentation, and a nice tasteful box for their â€œi â™¥ my tissuesâ€? line, almost in spite of the lack of leadership from Raef. 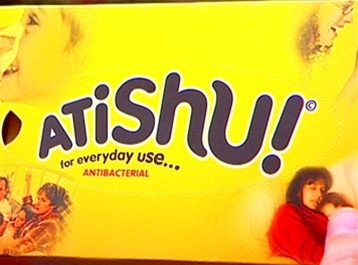 Over on the other team, Lucinda was having creative differences with Alex and Lee as they produced a garish bright yellow box covered in pictures of people sneezing, and a cheesy, not very well shot advert that blatantly placed the product in shot multiple times, and repeatedly mentioned the equally cheesy product name â€œatishu!â€?. The creative differences scuppered the presentation, with Lee seeming pretty embarrassed at the lousy performance he gave. So when it came to the boardroom, Raef and co seemed a picture of confidence, the opposition had produced a lousy looking add and a garish product, and his team had put on a slick show. But they’d missed the vital point, however good the production values, the advert didn’t show the product. Subtle advertising is not what Sir Alan is about. He never wants artistry, he wants to shift merchandise, so it was Raef that was shown the door, like a number of other budding Apprentice directors before.